Wondering what to do with those old electronic toys that keep counting, beeping and singing from the bottom of the toy box? Try rewiring them to create new electronic sound machines. 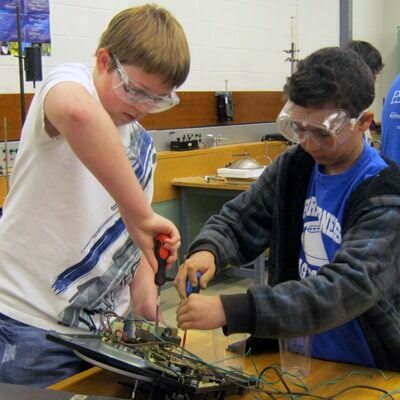 This practice is called circuit bending, and it’s the subject of a free hands-on lab hosted Saturday, May 17, by the STEM Outreach Bright Futures program. The lab will be held from 9 a.m. to noon in Room 146 of NIU’s Swen Parson Hall. Free parking is available at NIU’s parking garage. Organizers say this hands-on lab will be fun for elementary and middle school students. Parents are encouraged to play and discover alongside their children. “We want participants to learn about electricity and have fun experimenting with circuits,” says STEM Outreach associate Jeremy Benson. The group will “take apart electronic toys and then rewire them to make some crazy cool electric sounds.” Participants can bring their own used electronic toys to rewire or use one provided by STEM Outreach. Kids will learn about working safely with electronics, discover the circuitry within their toys, and come away with a funky, rewired electronic instrument. Benson will co-host the lab with circuit bending enthusiast Mike Taylor from NIU’s Digital Convergence Lab. Taylor holds a Master of Music degree in computer music and new media technology from NIU and has been circuit bending for almost 10 years. 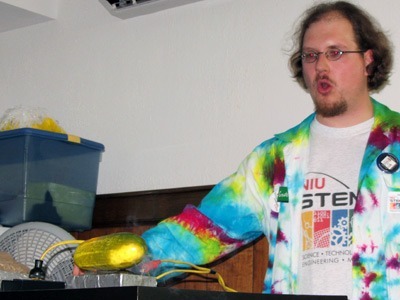 Jeremy Benson plans to use his famous electric pickle demonstration to help participants learn about safety when working with electronics. Sounds created depend on the toy or instrument, but benders can stumble upon cool glitch noises and creepy, interesting versions of the children’s melodies that many toys are programmed to play. The circuit bending lab is part of the STEM Outreach’s Bright Futures partnership with public libraries in DeKalb, Sycamore and Cortland. Throughout the spring, library patrons have been exploring the science of music with everything from a simulcast group-sing between the libraries and NIU’s School of Music; a mobile music session during which children created and performed songs using iPads; and an upcycling event where children recycled used materials to create their own instruments such as rain sticks, guitars and maracas. The Bright Futures program will conclude Tuesday, June 10, during a Science of Music Festival at Hopkins Park. From 5:30 to 8 p.m., STEM Outreach, local musicians and the DeKalb Municipal Band will present hands-on demonstrations with music, sound and technology. Visitors can see a musical Tesla Coil, play a PVC pipe organ, create acoustic art, get their faces painted and eat snow cones and electrocuted hot dogs. After the fair, participants can stay for the Municipal Band’s first concert of the summer season. STEM Outreach contact information is available online.